Smart contract platforms often use token sales to bootstrap their software development and early communities, as was the case with Ethereum (raising ≈ $18.4 million), Tezos (raising ≈ $232 million), & EOS (raising ≈ $4.2 billion). The mechanisms of a given token sale can have a long-lasting impact on the socio-economics and governance processes of a given platform. As a matter of fact, the amounts held by token holders once the blockchain has launched can be argued to be a large determinant of its future success. This fact rings most true in platforms where blockchain proposal, validation, and governance processes are controlled (in a tightly-coupled manner) by those who possess the native token. As such, this article will look at the token sales of Ethereum, EOS, & Tezos and analyze the data, especially from an equity perspective. We are currently in the process of developing a robust schema by which to categorize the 2,000+ token sales that have raised funds since 2014. The below diagram is a snapshot of this categorization as applied to Ethereum, Tezos, & EOS. The three token sales of note have been bolded and, whilst this infographic is far from an exhaustive characterization of all token sales, one can use it to better understand the particularities of the EOS, Ether, & Tezos token sales in particular. For example, out of the three, Tezos was the only token sale to accept more than one cryptoasset (both ETH and BTC), compared to the EOS and Ether sales which accepted ETH and BTC respectively. 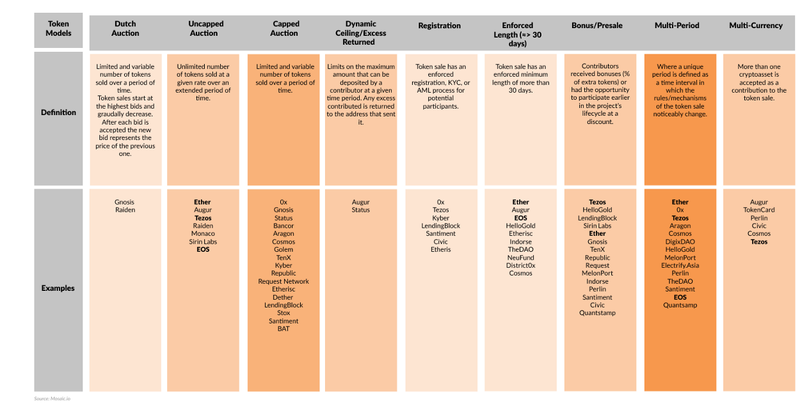 Moreover, one can notice certain similarities between all three sales; they were all uncapped auctions and involved multiple distinct periods within their sales, for example. Public Blockchains can be viewed as global commons or public goods, hence why there has been a great deal of writing over the last year on the topic of blockchain governance. Tezos and EOS’ block proposal and governance processes are designed in such a way that token holders have direct control over the protocol. Moreover, Ethereum will likely eventually transition to a block proposal model controlled by token holders. As such, the distribution of such protocols from their token sale and onwards is of the upmost importance. The below graphs show the Lorenz Curves of the address wealth token distribution of Ethereum, EOS, & Tezos during their token sale, at their genesis block, and then in the present day. 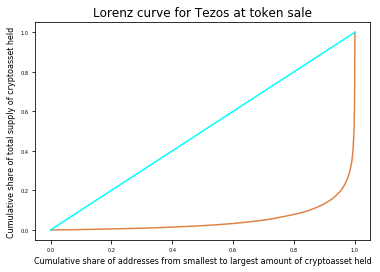 A Lorenz curve is a graphical representation of the distribution of income or wealth; the curve shows the proportion of overall income or wealth assumed by the bottom x% of the individuals within (typically) a nation. It is important to note that for Tezos we only observed the ETH contributions to the token sale. Moreover, the below table shows the Gini coefficient for the three protocols. The Gini coefficient is a measure of statistical dispersion generally used to represent the income or wealth distribution of a nation’s residents. The red line in the ‘Lorenz curve for Ethereum’ graph indicates an incomplete data set. Whilst Lorenz curves are useful when there are noticeable differences in inequality, in the case of Ethereum the differences during the three periods are more nuanced. However, one can clearly see from the Lorenz curves that the genesis block was less equal than the contributions made during the Ether presale. This is likely because of the ETHDEV address which received over 11.9 million ETH at genesis, thus making the genesis block’s curve more skewed outwards. Given for the ‘Lorenz curve of Ethereum’ graph we only have a complete data set for the distribution up-to (around) the 20th percentile of total ETH wealth, we’ll only draw comparisons up to that point. As of October 11, 2018 the top 0.000718% addresses (324 unique addresses) controlled around 50% of the total ETH supply, compared to 1.0907% (97 unique addresses) of total addresses for the Genesis block and 1.889% (around 170 unique addresses) of total contributing addresses for the Ethereum presale. Ethereum, based off this data, appears to be trending towards a more unequal wealth distribution over time. However, there are a number of caveats which must be considered before one argues that Ethereum has become more unequal over time. Firstly, the current Ethereum address-by-address distribution is greatly skewed by the presence of exchange wallets (37 of them which are easily identifiable) with combined holdings of over 6.8 million ETH. These wallet holdings represent ETH ‘owned’ by each exchange’s users and an argument can be made to not include such wallets in a wealth distributional analysis. Moreover, there are certain ETH-rich smart contracts such as the Wrapped Ether which represent the locked-up holdings of many other unique addresses and further skew the results. The 100 million EOS allocated to Block.one at the Genesis Block from then on skews the distribution of EOS. The nature of EOS’ Delegated Proof of Stake (DPoS) means that wealthy addresses (block producers) benefit from EOS’ inflation. Therefore, ceteris paribus, over time we can expect to see the EOS economy becoming more unequal. Many of the peculiarities of the EOS distribution can be attributed to the mechanics of the token sale. For example, the extremely long length, as well as the periodization of the sale incentivized users to take advantage of arbitrage, induced fear of missing out among (FOMO) speculators, and made it easier for the token issuer to (in theory) wash trade & unethically promote their token. The periodization of the EOS token sale made it easier for large addresses to make large purchases throughout the token sale; moreover, it may have incentivized individuals to make multiple purchases of EOS — in cases where they otherwise wouldn’t have. The largest single contributor (not including the Yunbi exchange address) sent 19 transactions to the EOS token sale contract; once in periods 235, 280, 281, 283–290, & 300, twice in 282 & 299, and three times in period 298. 6,283 addresses in total contributed more than once which was around 9.65% of the total number of contributing addresses. A contributor stands to gain from spreading their ETH evenly throughout as many periods as possible of the EOS token sale. The amount of EOS one received for a given amount of ETH is determined by the total demand for EOS within the given period, with the amount of EOS sent out remains the same (2 million EOS) on a period-by-period basis. Spreading one’s individual demand for EOS over more periods can be argued to increase the likelihood that the average EOS/ETH exchange rate across all relevant periods are more favourable — especially if the individual intends to contribute large amounts of ETH. For a working example, let’s consider address 0x6c8181afaa9c1bb2bccb05f37f0087ca696f28bb. Their utilisation of a (sub-optimal version) of the multi-period purchase strategy led to a total contribution of 150,000.1 ETH which, in turn, returned them about 9,789,693.835 EOS for an average EOS/ETH exchange rate (price) of around 0.01532. If the address had simply contributed in period 280 they would’ve purchased at an EOS/ETH rate of around 0.08828 and consequently received 1,699,066.850 EOS ( — 83% less). A single period, uncapped token sale would prevent such a strategy and mean that a single large contributor would be unable to use a similar strategy to maximize the exchange rate they receive. It is unclear what benefit there is in having an enforced length, multi-period token sale — from an equity perspective — though it should be obvious that such a token sale model could be ideal for a project simply aiming to raise as much money as possible. Another corollary of Block.one allowing EOS tokens to be tradable from period 1 of the token sale is the potential for arbitrage and (unfortunately) wash trading. The token sale EOS/ETH rate was greater than the median trading EOS/ETH rate on 138 days between July 1, 2017 to June 1, 2018. The median trading EOS/ETH rate was greater than the token sale rate on 212 days during the same period. In a perfectly efficient market we would expect parity between the two rates, instead the average absolute percentage difference was 8% and the median absolute percentage difference was 5%. While there undoubtedly was arbitrageur behaviour throughout the token sale, the inefficiencies (gas fees, difficulties claiming EOS tokens from the crowdsale, etc.) and lack of liquidity in the general EOS/ETH market — especially in the early days of the crowdsale (first month average percentage difference: 18%; first month median percentage: 7%) — limited the proliferation of arbitrage. Currently, only 66% of the total XTZ supply has been ‘activated’ — not yet usable by the contributors who purchased them during the token sale. This means that 34% of the XTZ purchased in the Tezos token sale is not accounted for in the current Lorenz curve and Gini coefficient calculations for Tezos. This could have a negative effect on reported inequality as wealthier XTZ holders are more likely to activate their holdings as soon as possible in order to benefit from baking and staking. The token sale and genesis data sets do not include the token amounts allocated to the Tezos Foundation, DLS, & Tezos’ early contributors. Including the allocations within the Genesis block calculations would likely increase the Gini coefficient substantially. Unlike EOS, Tezos’ ‘Liquid Proof Of Stake’ could be argued to limit the centralizing effects of a Proof of Stake model. Token holders are able to avoid their wealth being diluted via block production inflation by ‘delegating’ their block producing (baking in Tezos lingo) rights and thus receiving a share of the inflation rewards received by the block producer to whom they delegated voting. This mechanism can limit the effect of XTZ inflation — especially if the market for delegation services is competitive. Often inequality analysis is used as a wider attempt to quantify decentralization. We are of the belief that such efforts are likely of little use generally; however, the analysis of changes in token distribution over time — beginning with their token sales — can give an insight into the underlying system’s socio-economics and act as a guiding light for researchers designing the next generation of smart contract protocols. Moreover, for better-or-for-worse regulators seem to be considering inequality and ‘decentralization’ metrics in their judgements over tokens and token sales. That point alone should lead stakeholders within the cryptoasset industry to tread carefully when designing their systems, from a distributional and equity perspective, to remain in the good books of the SEC, FCA, & others. SEC Finance Director William Hinman’s comments on Ether suggested that over time the cryptoasset seemingly lost its qualities as a security. To the extent that “based on [his] understanding of the present state of Ether, the Ethereum network and its decentralized structure, current offers and sales of Ether are not securities transactions.”¹ Based on this reading, token sales such as EOS and Tezos which were generally carried out in a similar manner to Ether must be able to demonstrate (according to whatever criteria a regulator may have) that they are on a credible road to ‘decentralization’. In the case of EOS, the mechanics of the token sale, DPoS, & its wealth distribution certainly do the project no favour. To end the article, it is important to comment on a few of the limitations of the analysis done. This article considered how token wealth was distributed across addresses, in a similar way to an economist who would look at how income is distributed across a nation’s residents. However, an individual address is in no way equivalent to an individual user. One individual may own multiple addresses (i.e. it is possible, but unlikely, that the top 97 unique addresses on Ethereum are owned by one or a few individual[s]). Moreover, multiple individuals may share ownership of a single address, either indirectly if the address is run by a centralized third-party (i.e. an exchange) or directly through the use of multi-signature wallets or smart contracts which pool together funds (i.e. Wrapped Ether, Bidding Ring contracts, etc.). Moreover, the analysis done on cryptoasset token sales is different from that done with their current state and their genesis block. The former represents the distribution of the inflows into the token sale from unique addresses, whilst the latter represents the holdings of unique addresses. The two often have a 1-for-1 relationship, but not always. The most interesting finding from this article is the importance of tracking how wealth distribution for cryptoassets change over time. Such a metric is important for two reasons: (1) it seems to be a metric that legislators and regulators will care for going forward; (2) it allows us to see what effect a given blockchain’s sybil-control mechanism (Proof of ____) has on the socio-economics of the protocol going forward. Both concerns are existential concerns for all public blockchains. Over time we’ll refine the findings of this article and aim to expand this analysis’ scale to a wider set of cryptoassets. This article is intended for informational purposes only. The views expressed herein are not and should not be construed as legal or investment advice or recommendations. Recipients of this article should do their own due diligence, considering their specific financial circumstances, investment objectives, and risk tolerance before investing. The individuals contributing to this article have positions in some or all of the assets discussed. This article is neither an offer, nor the solicitation of an offer, to buy or sell any of the assets mentioned herein. ¹ Preston Byrne goes into this issue further and takes issue with Director William Hinman’s comments.